The tax world has been ablaze the last several weeks with discussion of ways to mitigate the Tax Cuts and Jobs Act’s limitation of the state and local taxes paid deduction. The bill previously stated that individuals couldn’t prepay state and local income taxes, but it made no mention of property taxes, raising the question: Could someone prepay their 2018 property taxes in 2017? In newly-issued guidance today, the IRS determined that prepayments must be both assessed and paid to be deductible in 2017. The IRS guidance issued today means that many individuals who prepaid might not benefit. According to the guidance, an individual’s property tax liability must be paid in 2017 to be deductible, but it must also be assessed. Estimating your property tax liability isn’t enough. The property tax must be billed too. Already, tax attorneys are on Twitter arguing over what a property tax assessment must contain and whether localities could issue them in the few remaining days of the tax year, so we haven’t heard the last on this issue. But for many who already prepaid, the benefit of their action is simply providing an interest-free loan to their municipality. Many state officials are spending the days leading up to Christmas analyzing the federal tax bill to see how it will impact state revenues. We at the Tax Foundation have been doing a lot of calls and answering a lot of emails on this, and states are generally finding a revenue boost from the bill. Why is that? State tax systems are directly affected by federal tax changes because nearly all states conform to the federal code in some way. For example, in 36 states, taxpayers start their state income tax form by using the gross income, adjusted gross income, or taxable income figure from the federal return. Nine states have no income tax, so that leaves just six states where taxpayers must start from scratch. This conformity—shadowing federal provisions—reduces tax compliance costs and generally makes things easier for everyone involved. Standard Deduction & Personal Exemptions. The federal bill roughly doubles the standard deduction while eliminating personal exemptions. Ten states (Colorado, Idaho, Maine, Minnesota, Missouri, New Mexico, North Dakota, Oklahoma, South Carolina, Vermont) and the District of Columbia conform to both provisions, so they should analyze the net impact of both changes. Two states (Connecticut and Nebraska) conform only to the standard deduction and may see a revenue loss. All states may also see a revenue gain from greater usage of the standard deduction; the federal bill is expected to reduce itemizers considerably, and most taxpayers file the same status for both federal and state tax returns. Pass-Through Provisions. The federal bill includes a 20 percent deduction for nonservice business income, subject to income limits. The deduction is based on federal taxable income, so two states (Colorado and North Dakota) would pick up this deduction immediately, and four other states (Michigan, Minnesota, South Carolina, Vermont) would do so when they next update their conformity. No other state would have this provision apply to state taxes without further legislative action. This deduction would likely reduce state revenue significantly, but it is difficult to estimate it precisely. States should therefore be cautious about conforming to this provision. Estate tax. The federal bill doubles the estate tax deduction level, and four jurisdictions (Delaware, District of Columbia, Hawaii, Maine) conform at the same level. Delaware and DC conform automatically, while Hawaii and Maine would conform when they next update their conformity plan. The doubled exemption would result in somewhat minor revenue losses. State and local tax deduction (SALT). The federal bill replaces the existing unlimited deduction with a maximum $10,000 deduction for property plus either income or sales taxes. No state allowed taxpayers to deduct SALT from their state taxes, in large part because it would be circular, so the cap will have little impact to state revenues. The direct effect to state revenues is a net gain, in that many taxpayers who currently take SALT will instead take the standard deduction, potentially adding to the state tax base. However, there is an indirect effect in that taxpayers will bear the full cost of state and local taxation, which would be a net tax increase for some high-income taxpayers. Additionally, the federal bill prohibits 2017 prepayment of state income taxes but not local property taxes, so there may be a shift in such payments from 2018 to 2017 by taxpayers seeking to maximize their deduction before it is capped. Repatriation. Both bills impose a one-time tax on repatriation of ~$2.6 trillion of overseas assets. The tax is “deemed” and is paid immediately, not when assets are repatriated as in an earlier repatriation holiday. States will receive a windfall from this, although it will be uneven based on where international companies have state tax liability. We are still researching the state-by-state conformity with Subpart F and foreign tax deductions. Expensing. The federal bill allows full expensing for a number of years before phasing out, and reduces interest deductibility. States should evaluate the net impacts of these provisions together when deciding conformity. Net Operating Losses (NOLs). The federal bill caps NOL carryforwards at 80 percent and repeal carrybacks. Most states “shadow” the old federal NOL rules, following them without necessarily conforming directly to them. Choosing to conform will probably increase revenue overall, although NOLs can vary greatly year by year. As I noted above, most states have found positive revenue impacts from the federal bill. Maryland Governor Hogan (R) is discussing legislation that would return the state’s windfall to taxpayers in some form, perhaps by targeting high-income taxpayers likely to be paying more due to the SALT cap. For Iowa, federal tax reform may provide revenue that would enable the state to undertake its long-talked-about state tax reform. One state found an earlier version of the federal tax bill will reduce revenue, however: Montana. Its revenue analysts found a huge drop in individual income tax revenue from the pass-through deduction and a large drop in revenue by assuming that PAYGO would take effect and reduce the state’s mineral royalties from the federal government. Neither turned out to be accurate assumptions: the pass-through deduction will not apply to Montana under current law (Montana follows federal adjusted gross income, not taxable income) and PAYGO will likely be waived this week, as it always has been. I’m told Montana is working on an updated revenue estimate, and with updated and less gloomy assumptions it will likely show a revenue boost as well. Indirect effects of the tax bill must also be kept in mind. The federal bill includes repeal of the health-care individual mandate, which experts say will have negative effects on the individual health insurance market. States may feel obliged to help address these negative effects. Conversely, the pro-growth elements of the federal bill (even the center-left Urban-Brookings Tax Policy Center concluded the bill will boost economic growth) will increase state income and sales tax revenues in some indeterminate amount going forward. We welcome questions from state officials and others on conformity, which we expect will be a main area of focus in 2018. H.R.1 – originally named “The Tax Cuts and Jobs Act of 2017” and subsequently retitled to conform to Senate Budget rules as “An Act to provide for reconciliation pursuant to titles II and V of the concurrent resolution on the budget for fiscal year 2018” – has passed the Congress and awaits the President’s signature. We estimate that the Act will boost investment, employment, and incomes in the United States. That is good news. However, another outcome of the bill may cause concern in some circles, and might be given a bad-news “spin.” To wit: the bill will temporarily increase the U.S. current account (or trade) deficit. This should not alarm anyone but instead be viewed as a positive sign that the world wants to invest in America. It will not harm the U.S. economy. On the contrary, it will facilitate the expansion of the U.S. capital stock, our productive capacity, and our ability to compete in the world. Looking only at the permanent reduction in the corporate tax rate to 21 percent, we expect long-run GDP to be 1.7 percent higher after all economic adjustments. This would imply an increase of roughly $1.8 trillion in the quantities of plant, equipment, and commercial and residential structures in the economy, boosting productivity, wages, and employment. If the rest of the tax bill is extended on a permanent basis, particularly the expensing provision and the reduced income tax rates, including the reduced rates on business income, the increase in GDP would be nearer 4.7 percent, and the stock of capital would be close to $5 trillion higher than under current law. These potential additions to the U.S. capital stock must be funded through additional saving. Some of that added saving will be done by Americans. The higher returns on capital will cause people to save more, to buy more American stocks and bonds, and to pump more money into their small businesses. The corporate and individual tax reductions on business income, and the faster depreciation permitted by expensing, will boost businesses’ saving directly by raising after-tax cash flow. A portion of the tax cuts on wages and salaries will be saved. However, these increases in domestic saving may not be large enough to cover the capital stock expansion and the increased federal borrowing to fund the deficit. For the remainder, we must look to international capital flows. The World Bank projects global saving over the next decade of about a quarter of a quadrillion dollars. That’s $250,000,000,000,000. An infinitesimally small portion of that projected world saving may be redirected toward the United States, by several means. U.S. businesses may repatriate cash held abroad. U.S. banks and mutual funds may lend more at home and less abroad. Foreign banks, mutual funds, and individuals may lend more or invest more in the United States and less at home. Foreign businesses may expand their U.S. subsidiaries. Any increase in the capital inflow coming to the United States will be matched by an equal increase in the U.S. current account deficit. This is an accounting truism. Increased capital-flows toward the United States provide an inpouring of foreign exchange seeking dollars. The dollar will rise, until there is a corresponding increase in U.S. purchases of foreign goods and services to balance the capital inflow. The increased spending will be in part for investment goods to expand U.S. factories, and in part for consumption goods. These increased outlays will be over and above the rising levels of production in the United States, not a substitute or diversion away from U.S. production. It is only normal, and historically true, that when a nation begins to grow more rapidly than its trading partners, its purchases of foreign goods grows more rapidly than its sales to foreign buyers. When a trade deficit is the result of increased growth, rather than a drop in buying by foreign customers, it is not a drag on the domestic economy. The capital inflow to assist in the additions to the capital stock will be temporary. There will be only a finite amount of additional capital to be built here. Once that capital has been funded, the capital inflow for that purpose will be complete, and international saving-flows will return to normal, as will the level of the dollar and the current account (trade) balance. In the short run, the capital inflow will boost the dollar and the current account deficit. In the medium run, foreigners will receive an increased stream of dividends and interest on their added U.S. assets, which will assist in reversing the capital-flow, the rise in the dollar, and the current account increase. In the long run, U.S. savers will be earning more interest and dividends too, and the effects on the capital-flow will fade. Also note that, as the added capital is put in place, American wages and employment will rise, and the total amount of saving done by Americans will rise. Over time, Americans will fund more of the expansion. As Americans add to their assets, some of the government bonds that foreigners may have initially bought may be refinanced by Americans. Americans will increase their holdings of domestic or foreign stocks and bonds. In the long run, the holdings of domestic savers versus foreign investors will return to normal shares of the (larger) total stock of productive capital in the United States. Several things are clear. The tax bill will boost investment and incomes in the United States, and make the country a better place to locate production and hiring. There will be a transitory rise in the trade deficit, but in the context of a stronger, faster-growing economy. The associated capital-inflow will speed the expansion of U.S. industry and employment. Finally, there is no reason to interpret the temporary trade swings as detrimental, or providing an excuse for restraint of trade or abandonment of trade expansion agreements. Congress today took a historic step toward rewriting the U.S. tax code for the first time since 1986. Our Taxes and Growth model shows that this legislation over the next decade will boost GDP by 1.7 percent and wages by 1.5 percent, while creating 339,000 additional jobs. For far too long, the U.S. has lagged behind its trading partners with an extremely high corporate tax rate and a worldwide tax system. Now the U.S. will have a much more competitive corporate rate at 21 percent, as well as a territorial tax system that only taxes businesses on income earned domestically. Businesses no longer will be discouraged from reinvesting their profits in America. Admittedly, the bill isn’t perfect and represents a balance among political compromises, fiscal constraints, and pro-growth policies. The special tax treatment of pass-through businesses could lead to costly, time-consuming tax planning opportunities and disputes. Full expensing—potentially the most pro-growth tax policy lawmakers could adopt—is only made temporary, which means the growth effects will be somewhat muted. And shifting to a territorial tax system, while important, will involve difficult decisions about base erosion rules that will require careful analysis to prevent any unintended consequences. Nevertheless, it is encouraging to see Congress work through the very difficult, challenging process of reforming the tax code and producing an end product that makes important progress. We at the Tax Foundation have worked hard to educate federal and state lawmakers about the trade-offs involved and will continue to do so throughout implementation of the bill. Tax Policy – Does Your State’s Corporate Income Tax Code Conform with the Federal Tax Code? Last week, we reviewed how states are conformed to the federal tax code for individual income. 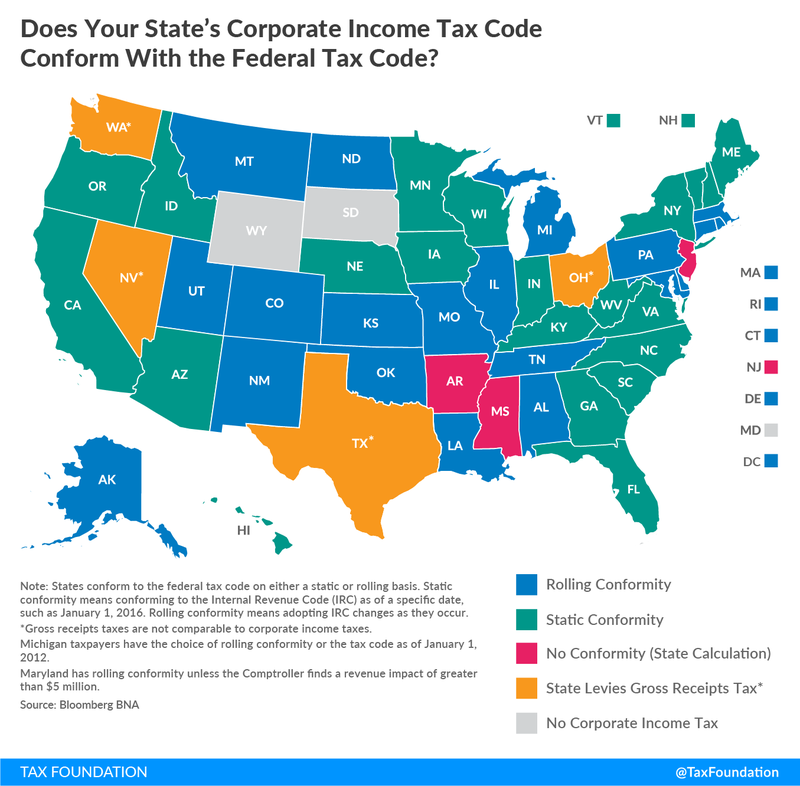 Many states use the federal tax code as the basis of their state individual income tax code, but even more states use the federal corporate tax code to form their state corporate income taxes. For reasons of administrative simplicity, states frequently seek to conform many, though rarely all, elements of their state tax codes to the federal tax code. This harmonization of definitions and policies reduces compliance costs for individuals and businesses with liability in multiple states and limits the potential for double taxation of income. No state conforms to the federal code in all respects, and not all provisions of the federal code make for good tax policy, but greater conformity substantially reduces tax complexity and has significant value. States conform to the Internal Revenue Code (IRC) for corporate income tax calculations. (Last week’s map looked at individual income tax conformity.) States tend to conform to either taxable income before net operating losses or taxable income after net operating losses. Forty-one states conform to one of these two definitions of income. Three states have their own calculations of income, and the remaining states either do not tax corporate income or impose a statewide gross receipts tax (see map below). In general, states are more conformed on corporate income than individual income, but even when conformed on the definition of level, many states decouple on other provisions. For instance, many states do not conform on the length of time that net operating losses can be carried forward or backward, but the majority of states do conform to federal Section 179 bonus depreciation schedules. How states define their tax bases would matter a great deal for their revenue impacts under federal tax reform. For instance, the federal tax changes in the Tax Cuts and Jobs Act expand the base of taxable income in many different ways, such as limiting the deduction for net interest or the Section 199 domestic production deduction. The federal changes include rate cuts to offset the broader bases, but states set their tax rates independently. Absent state-level changes, states would have a much larger tax base without correspondingly lower rates, leading to higher state-level revenue. A more detailed list on state conformity is available here. Source: Tax Policy – Does Your State’s Corporate Income Tax Code Conform with the Federal Tax Code?